No one, including me, eats dessert all the time, and that’s why, when I do have dessert, I like to go big or go home. Which brings us to this cake. When I say go big, I mean big – deep dish! Dark chocolate! And did I mention the almond butter swirl? To say nothing about the chocolate drizzle to top it all off? It’s almost hard to believe this is all paleo-friendly, but miraculously, it totally is. It’s ridiculously easy to make. It takes nothing more than a few bowls and a spoon, a baking pan and a tongue to lick the spoon. You really wouldn’t want any of this batter to go to waste. But don’t eat too much of it. This is one of those cakes that is infinitely better after baking than before. So, don’t taste the batter and go “hmm, the chocolate flavor isn’t very pronounced; I’m going to add more cocoa powder“. Just trust me, it’s all going to be fine after the oven works its magic. The cake is irresistible. Bryan and I ate two whole ones in about a week and a half (luckily, the recipe makes a smaller 6″ cake…but still). Its crumb is dense, but the cake still feels light and just airy enough. 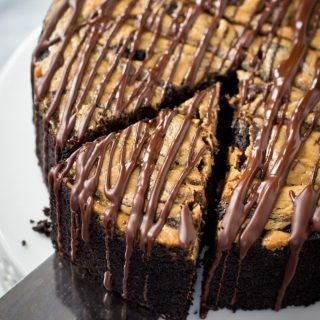 The little bit of almond butter on top is just creamy enough to complement the chocolate flavor of the cake and the chocolate drizzle that finishes it all off creates a satisfying crack when you sink your teeth into the first bite. It’s also deeply chocolatey, low-glycemic, profoundly satisfying, and guaranteed to sweep you off your feet. This is the perfect crowd-pleasing paleo dessert for anyone who loves chocolate, paleo or not! PS: I am also guest posting over at Primal Palate’s blog today. You can check it out here! Preheat the oven to 350F. Coat a 6" springform pan with nonstick spray and set aside. In a large microwave-safe mixing bowl, melt the chocolate chips and butter/coconut oil together by microwaving on high for about 60 seconds until nearly melted, and stirring until completely smooth. Stir in the rest of the wet ingredients (eggs, vanilla, applesauce). 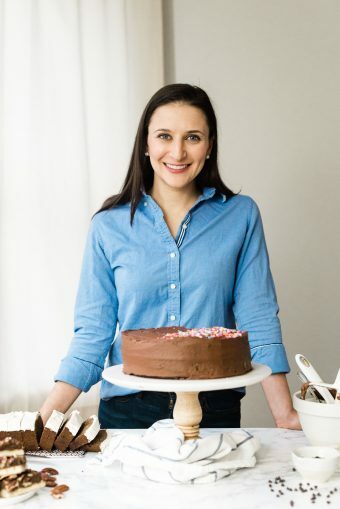 In a separate bowl, whisk together the dry ingredients (almond meal, cocoa powder, baking soda, sweetener, and salt) and then stir the dry mixture into the wet mixture. Pour the batter into the prepared cake pan and smooth into an even layer. In a separate bowl, prepare the swirl by stirring together the almond butter and granulated sweetener. 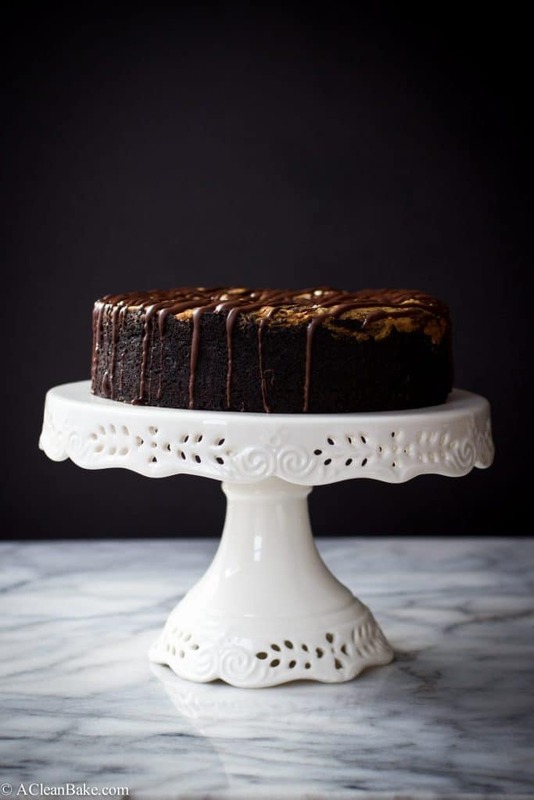 Distribute spoonfuls of the almond butter across the cake (or pour into a zip top bag, seal it, snip off the corner, and use it to pipe thick lines of almond butter across the cake), then gently drag a butter knife or toothpick through to create the swirl pattern. Bake for 35-40 minutes until tester comes out clean. Cool in the pan for 15 minutes, before removing from the pan and cooling completely on a wire rack. Melt the remaining 1/4 cup chocolate chips and, while still warm, drizzle over the top of the cake. Allow to set before serving. Sweetener note: I used semi-sweet chocolate chips when creating this recipe, and I like super-dark chocolate flavor, so I only needed 2 Tablespoons of sweetener. Depending on your chocolate, your cocoa powder, and your sweet tooth, you may prefer a few more Tablespoons of granulated sweetener. Taste the batter and adjust the amount of sweetener to your preference. If you don't have 6" cake pans, one reader reports that making the recipe using a cupcake pan works well too. She put 3 Tablespoons of batter in each compartment of the cupcake pan, baked for 15 minutes, and let the cakes cool in the pan for 15 minutes before transferring them to a wire rack to cool completely. Your baking time may be a little more or less, depending on the heat of your oven, so start at 12 minutes, if your oven tends to run hot and then add 3-5 minutes more at a time, testing in between, until the tester or toothpick comes out with just a few crumbs on it. If all you have is a 9" springform pan, you can double the recipe and use your larger pan. However, you may need to adjust the baking time so start at 30 minutes and add more time in 5 minute increments. Just be sure to watch it very carefully. Serve immediately, or store the leftovers in an airtight container at room temperature for up to 5 days. I think that the phrase GO BIG OR GO HOME was invented for this cake. It’s a beauty! You weren’t joking about going big. This looks and sounds AMAZING. I can’t wait to give this a try! Hope you like it, Camille! I’m so sorry to tease you with this while you’re doing AIP, but can’t wait for you to try it when your body is ready! Ooooohhhh!! 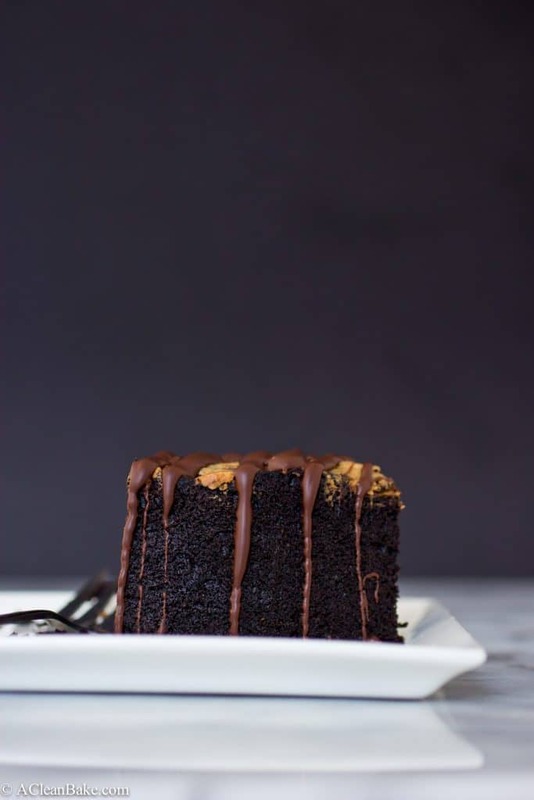 Dark chocolate cake is the ultimate! I see why you and Brian put two of these down in a week! I’d do the same, I’m certain. OMG! 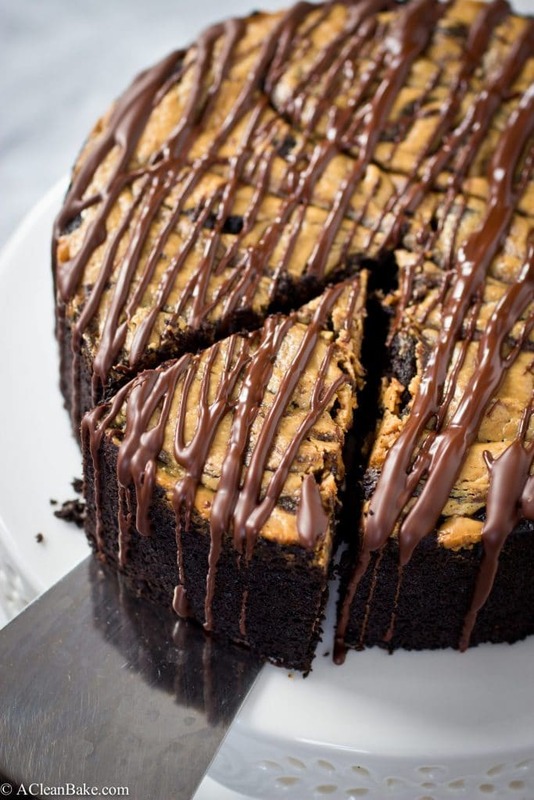 The addition of almond meal and then the almond butter swirl, puts this over the top for me! What a fabulous combination, Nora! Thank you for this! You’re welcome, Traci! Hope you get a chance to sample it soon! Ummmmmmmmm I WANT A PIECE OF THIS BEAUTY RIGHT NOW! It’s ALMOST too pretty to eat, but you know I love me some dark chocolate! Please move closer so we can share dessert!! WOW! What an absolutely stunning cake! I love chocolate paired with nut butter!! oh my gawd, this cake!!! gorgeous! I’m sure it will taste just as good, if not better, cooked! And, yes, the cooked version was great. Hahaha!!! No shame. 😉 That just means you’ll have to make it again! As usual with so many sites like this, the outcome is never the same as the pictures. To achieve the volume and height I have to double the recipe. Why not just say so? Hi Andrew. It sounds like you used a standard 9″ springform pan to make this recipe which, as noted in the recipe notes, will require you to double the recipe to achieve the proper cake height. So I’m not sure what you mean by “as usual with sites like this”? Sorry I actually used a 6″ pan. No way possible there was enough volume to create anything like yours in the photo. My comment whilst appeared off hand is something I’m sadly seeing all too often. Invariably what’s in the image is a double mix, different quality flour etc. The other one that gets me is Buckwheat flour that makes white coloured outcomes. Totally impossible. Given all of that, the outcome, however thin, was wonderful. I will double up in future and will rest assured make again. Hmm, that’s very strange. I used the same pan and never doubled the recipe. I don’t doctor the recipes in the slightest for the pictures. What you see is always what you get – I follow the exact same recipe that I give you! I’d really love to know what happened since quite a few people have made this recipe successfully and I’ve made it several times and it always comes out the same. Was your pan 6 inches across (diameter, not radius)? As for the other complaints, I can see your frustration with coconut flour: it is a very unique consistency and if not treated exactly right it can produce a gummy or gritty consistency. As for buckwheat flour, I believe that, theoretically, it can be white if it is processed enough (like all purpose flour is to whole wheat flour) but I have never seen white buckwheat flour in the stores myself. Anyway, I think with the exception of 1-2 recipes on this site, there is no buckwheat flour required! I’m giving it another go same again and see what transpires. I cut down of the sweetener (I’ve got diabetes and so much is over the top sweet) … interesting the mix was sweeter than the outcome. Thanks for you honesty and openness …most welcome. Also, can I use coconut flour instead of almond flour? Thanks! No, I’m sorry, coconut flour actually acts very differently from almond flour so unfortunately you can’t sub one for the other. Hi! You probably can, though I haven’t tried it. It sounds like it should work fine! I would recommend either using a smaller bundt pan or doubling the recipe. This recipe probably won’t be nearly enough to fill a standard size bundt pan. Let me know how it turns out! Thank you for the clarifications. It’s greatly appreciated! I just went to a bulk store and they only have almond meal. A lot of the stores in my area have almond flour/meal available so I don’t know what to get. Btw, does quinoa flour work with this recipe? Hi Heidi! You can definitely use almond meal. If you can get the finely ground kind using blanched almonds (you’ll know because the flour will be a tan color, rather than flecked with dark brown), that will work best, but whatever – flour or meal – you can get your hands on will still work. Oh and I couldn’t find a decent springform pan either lol. Bundt pan it is! Thanks a bunch, Nora! It’s greatly appreciated. How much sweetener should be mixed in with the almond butter swirl? I’m not seeing this listed in the recipe. Sorry about that! The info got lost in a file transfer. I’ve updated the recipe – should be 2T in the batter, 1tsp in the swirl. Thanks for catching that! Do you think I could use coconut sugar or maple sugar in place of the monk fruit sweetener? I’m not sure about maple sugar but coconut sugar should work fine. It may be a bit less sweet than it would be with stevia or monk fruit though. Looks delicious! Does anyone know the nutrition facts on this recipe? Calorie/ carb count? Hi! I just added the nutrition info for you. It is below the recipe!